Niger Deltas Points Against JTF! A descisive starting point of the Protestant Reformation was on October 31st, 1571, when the Augustinian monk nailed his 95 theses to the door of the castle church at Wittenberg, in the German state of Saxony. Martin Luther called his 95 theses 'Disputation for Clarification of the power of Indulgences'. His purpose was not to confront nor challenge the authority of the church but to point out the excessess and abuses regarding the sale of papal indulgences. Luther made use of the quickest means available to express publicly his opinions of the whole circuslike affair by nailing his 95 theses and points of debate on the church door. In 1521, Luther was summoned to the diety, or assembly, at Worms. He was tried by the emperor of the Holy Roman Empire, Charldes V, a staunch Catholic, as well a by the electors of the Gerrman State and other leaders and dignitaries, religious leaders and seculars. When pressed once again to recant, Martin Luther made his famous statement, 'Unless Iam convicted by the Scripture and plain reason............I cannot and I will not recant anything, for to go against my conscience is neither right nor safe, so help me God! Welcome to Niger Delta, 'Where the sun never sets' 'The Pride of the Nation 'The Treasure Base of the Nation' 'The Big Heart', regal in aquatic splendor, once consume by the Niger Delta militants and now being eaten by the termites called the joint Task Force [JTF] 'Operation Pulo Shield'. The outgoing Commander of the Joint Task Force [JTF] operating in the Niger Delta, Major General Johnson Ochoga, admitted that some of its personnel were corrupt, “There’s no organization that will say it is 100 per cent clean [from corruption]; so also is with the Joint Task Force 'Operation Pulo Shield'. ’ll not say we don’t have bad eggs; but to those soldiers [involved in corruption]; every day is for the thief and one day is for the owner". Unemployment, poverty, and glaring crude oil thefts 'Sophisticated Ring', an amphitheater of neglect! These is what pervades the Niger Delta. Following cessation of hostilities and the amnesty programme granted the militants, and with the relative peace pervading the Niger Delta. The Joint Task Force [JTF] has technically hone their skills towards engaging in the lucrative crude oil plundering, after all it is part of the national cake [free for all and for those who can]. To some JTF is simply 'Just Total Failure', the region is home to Africa's second largest concentration of illegal arms and weapons after Congo DR. What about captured photographs of uniformed men [in military uniform] escorting barges loaded with stolen crude oil an captured photographs of uniformed men [in military uniform] guarding and supervising loading of stolen crude oil into barges? Are these oil thieves sacred cows? And why are their 'Sophisticated Ring' remain unbreakable? Are they being backed by the system? With his recent comments on Niger Delta Development Commission [NDDC] by President Goodluck Jonathan, that NDDC STINKS! According to my tour guide, Amiekumo Tombriye, a Sagbama resident, JTF simply means, 'Just Total Failure'. In Nembe creeks, Bayelsa State, Krakrama and Awoba in Kalabari axis of Rivers State, as well as areas close to coastal Bonny, also in Rivers State and other parts of the Niger Delta, the illegal pipelines vandalizing and oil thieves are having a field day. Should we also engage AFRICOM, United States Military High Command responsible for Africa based in Stuttgart, Germany? A passenger boat operator at Nembe waterside, Yebiri Alexander, says "Unto to thy hands oh Lord, we commit our resources", Niger Delta's dream of peace, but are plague by hostilities, they cherished law and order, but cannot stem the tide of insecurity, they had to trust their neighbor, but have to lock their doors for protection. Oil thefts in Niger Delta is on the rising scale the highest in the past three years NEVER BEFORE SEEN! The Joint Task Force [JTF], remember October 31st, 1517, when the Augustinian monk Martin Luther nailed his 95 theses to the door of the castle church at Wittenberg [Gutenberg], the state of Saxony, Germany in protest! JTF Activities In Niger Delta: Line of Duty or Plundering? Joint Task Force (JTF) Activities In Niger Delta: Line of Duty or Plundering? In the name of protecting and securing Nigeria and Multinationals Oil installations and facilities, curtailing militants attacks and activities, maintaining law and order in the troubled Niger Delta Region Of Nigeria. This is why the Joint Task Force [JTF] was established, but has this outfit live up up to it's billings? Shell Petroleum Development Company [SPDC] claims it has been loosing 60,000 barrels of oil of oil thefts along it's Nembe trunk line, the highest in three years! With the oil barons thieves building expansive farm tanks, refineries and large ocean going barges. JTF that is supposedly mandated to manned the Niger Delta creeks down the Bonny River Channel has gone to sleep or simply put' 'turned a blind eye' to the sophisticated and powerful oil thefts barons. JTF is equip with Naval speed boats and reconnaissance hover crafts, how come this devastating atrocities are been perpetrated and committed under the nose and eyes of the JTF, without JTF discovering, arresting and prosecuting the masterminds? 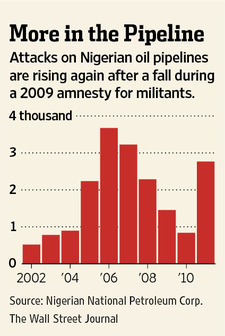 Close to $7 billion dollars was said to have been lost to oil thefts, is JTF up to the task of securing the Niger Delta? The plundering of Niger Delta in the name of keeping peace is now glaring and becoming a stark reality. The recent court judgment against the federal government for the Odi invasion and annihilation of it's entire citizen still remains fresh. What about the Gbaramatu mop up by the JTF? The multinationals can as well provided and maintain their respective pipelines if allowed, as their security personnel will not compromise. The JTF activities in the Niger Delta region should be x-ray and if possible a total pull out of the JTF from the region and allow the multinationals oil companies to hire their own private security personnel to manned their pipelines and incorporate the local vigilantes along the pipelines. 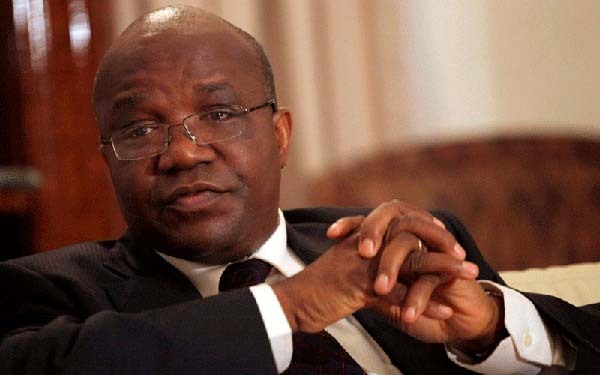 With the possible closure of it's Nembe trunk line by Shell Petroleum Development Company [SPDC], for what the company Managing Director/Chief Executive Officer, Mr Mutiu Sunmonu called 'Extensive Plundering', JTF activities should be called to question as to how and why these activities are taking place under their eyes? From Odi invasion to Gbaramatu Kingdom mop up and annihilation, what is JTF still doing in the Niger Delta Region? Where as the aim then was to maintain peace, protect the Bonny River Channel and curtailed the then restless Niger Delta Militants. The multinationals has in their wisdom contracted out the security of their respective pipelines to the security officials [ex-militants] and this has to some extent reduces vandalizing of oil pipelines. Let these steps be extended to the creeks and Bonny River Channel. Enough of this plundering in the Niger Delta in the name of keeping PEACE! Alhaji Dokubo-Asari once stalked the mangrove-choked creeks of the Niger Delta, a leaf stuck to his forehead for good luck, as a crew that he ran bled oil from pipelines and sold it to smugglers. "Asari fuel," they called it. Last year, Nigeria's state oil company began paying him $9 million a year, by Mr. Dokubo-Asari's account, to pay his 4,000 former foot soldiers to protect the pipelines they once attacked. He shrugs off the unusual turn of events. "I don't see anything wrong with it," said the thickly built former gunman, lounging in a house gown at his home here in Nigeria's capital. Nigeria is shelling out hundreds of millions of dollars a year to maintain an uneasy calm in the oil-rich delta, where attacks ranging from theft to bombings to kidnappings pummeled oil production three years ago, to as low as 500,000 barrels on some days. Now production is back up to 2.6 million barrels daily of low-sulfur crude of the sort favored by U.S. refineries, which get nearly 9% of their supply here. The gilded pacification campaign is offered up by the government as a success story. But others say the program, including a 2009 amnesty, has sent young men in Nigeria's turbulent delta a different message: that militancy promises more rewards than risks. While richly remunerated former kingpins profess to have left the oil-theft business, many former militant foot soldiers who are paid less or not at all by the amnesty, and have few job prospects, continue to pursue prosperity by tapping pipelines. Now, oil theft appears to be on the rise again. Royal Dutch Shell RDSB.LN -0.19% PLC's Nigerian unit estimates that more than 150,000 barrels of oil are stolen from Nigerian pipelines daily. That is one of the lower estimates. In May, theft from one pipeline got so bad that Shell simply shut it down. "Everybody seems to believe…that the Niger Delta problem is over," said a former government mediator, Dimieari Von Kemedi. "It's just on pause. The challenge is to move from pause to stop." Meanwhile, Nigeria is facing a separate militancy, in the form of the radical Islamic group Boko Haram, whose guerrilla attacks on churches and police stations in a different part of the country have left hundreds dead. Some legislators have proposed extending amnesty to Boko Haram, as well. what it spends to deliver basic education to children. Under the arrangement, the government grants living allowances to tens of thousands of former members of the bandit crews and sends them to vocational classes, in sites ranging from Houston to London to Seoul. These costs are on top of millions of dollars paid at the outset to the crews' leaders for handing in their weapons. For a few, the program has meant spectacular rewards. To improve ties with former delta warlords, the government invited the top "generals," as they call themselves, for extended stays on the uppermost, executive floors of Abuja's Hilton hotel. The Nigerian state oil company, according to one of its senior officials, is giving $3.8 million a year apiece to two former rebel leaders, Gen. Ebikabowei "Boyloaf" Victor Ben and Gen. Ateke Tom, to have their men guard delta. "For you to address the whole issue of poverty and development, you need some kind of peace," added Mutiu Sunmonu, managing director for Shell's Nigerian unit. "That is what I think the amnesty program has offered." Enticed by the program, the militants emerged a couple of years ago from the oil-soaked swamps of the delta. Some of the leaders took up residence in the executive floors of Abuja's Hilton and through much of 2010 and early 2011 spent weeks or months enjoying the Executive Lounge's complimentary supply of Hennessey V.S.O.P. cognac, priced at $51 a shot on the room-service menu. Over a buffet of fiery Nigerian dishes—gumbos, Jollof rice pilafs, goat stews—they rubbed shoulders with the country's leading politicians and influence peddlers, who often live in the floor's $700-a-night art-deco rooms. "These are young men who came out of the creeks and were given the opportunity to hang out with the crème de la crème, wearing gold watches and drinking from gold-rimmed teacups," said Tony Uranta, a member of the government's Niger Delta Technical Committee advisory group and a frequent Hilton executive-floor guest. "It's a natural thing." Most have since moved out of the hotel. "It's too high-profile," said an aide to one ex-warlord, Mr. Tom.Meanwhile, thousands of former militant foot soldiers have been given job training, a feature of the program that officials call its most indisputable success. The question is how many will be able to make use of this training. In Nigeria, the government estimates, there are 67 million other people waiting to be employed. Kempare Ebipade says he spent six years guarding creekside armories as an oil militant, in the course of which he took two bullets to the thigh. In 2009 he accepted amnesty and was sent to the U.S. for two weeks at the Martin Luther King Jr. Center for Nonviolent Social Change in Atlanta. He displayed a booklet of Dr. King's speeches from which he said he sometimes reads to villagers. Mr. Ebipade is a skilled welder now, trained in the craft by the amnesty program. But the father of four struggles to imagine how he will find clients for a welding workshop he has set up, or how he will continue to afford his apartment's rent of $1,100 a year. The government has vigorously pushed oil companies to hire locals. Mr. Ebipade says that out of the former militant army of 10,000 he belonged to, he has heard of only five that landed jobs with oil companies. Shell's Mr. Sunmonu warned against the idea "that every trained ex-militant is going to get a paid employment, because if you just look at the number, it's probably huge. So we therefore must broaden our solutions to focus more on self-employment: small enterprises, medium enterprises." The Niger Delta has seen promising economic progress. Construction on a regional highway is under way. Nigeria's overall economy is projected to grow at a brisk 7.1% this year. But much of the growth is in cities far from the delta, and a population boom reduces the degree to which the growth helps with the unemployment problem. In the delta, years-old electric towers punctuate village skylines, but many don't carry electricity, having never been connected to the overtaxed power grid. Children travel to scattered schools aboard canoes, navigating creeks coated by the rainbow stains of oil slicks. A United Nations office has estimated it would take 30 years to clean the waters, which once sustained fisheries. Amid this landscape, oil-related crime lures locals like Atu Thompson, father of 18 and self-described oil thief, who says he and others see few other ways to provide. "You can take me to amnesty, give me a good contract—but others are still there," Mr. Thompson says. Mr. Dokubo-Asari, 48 years old, used to be prominent among them. While not all of his account of life in the mangrove swamps could be verified, he long was one of Nigeria's best-known oil marauders. About 25 years ago, Mr. Dokubo-Asari left overcrowded university classrooms, he says, to study guerrilla warfare in the Libya led by Col. Moammar Gadhafi. He says he was given $100,000 to stir up trouble back in Nigeria, an oil competitor to Libya. Fomenting conflict proved easy in the restive Niger Delta he returned to in the early 1990s. From a local governor, Mr. Dokubo-Asari says, he procured weapons and money to build a militia that ultimately was several thousand strong. For years, as he tells it, they broke open pipelines, filling canisters with crude oil and refining some of it through timeworn techniques used by locals to boil palm-tree sap into wine. The government struggled to lure him out of the mangroves. Mr. Dokubo-Asari responded to one amnesty offer that he considered meager by announcing a death threat against petroleum workers. Shell evacuated hundreds of expatriates and oil derricks briefly slowed to a stop. The next day, oil prices hit $50 a barrel for the first time. 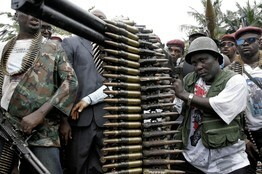 Nigeria's government offered Mr. Dokubo-Asari a truce and $1,000 apiece, he says, for his AK-47 rifles, numbering 3,182. He says he took the deal and used the profits to purchase more weapons and return to the swamp. There, he recounts he was finally arrested and coerced into another round of negotiations. Fearing assassination, he fled to Cotonou, Benin, where he says he founded a school for Niger Delta children. He showed a video of him teaching kids kung fu at the school. New warlords quickly took Mr. Dokubo-Asari's place. Marauding under noms de guerre like Gen. Shoot-at-Sight, Gen. Africa and Gen. Young Shall Grow, they formed a loose confederation of gunmen calling itself the Movement for the Emancipation of the Niger Delta, or MEND, and crippled enough oil infrastructure to bring Nigeria's production on some days to a near-halt. That was when Nigeria announced the 2009 amnesty. In televised ceremonies, guerrillas dropped off rifles, machine guns, tear-gas canisters, dynamite bundles, rocket launchers, antiaircraft guns, gunboats and grenades to be sold to the government, which also offered the nonviolence training courses and nine-month vocational classes. Theft fell sharply. Yet now, just as Nigeria's state oil company has begun institutionalizing pipeline-watch jobs for some ex-militants, theft has blossomed again. "It's quite an escalation. If nothing is done, it will continue to increase because more and more people will just come to feel that this is a gold field," said Shell's Mr. Sunmonu. "We're not going to give up on this and run away from it. We believe it can be stopped." Maclean Imomotimi left an overpacked university four years ago, the muscular 30-year-old says, to rob barges in the Niger Delta swamps. Now, befitting his new career, he is known as Gen. Imomotimi. He says he accepted the government's amnesty offer in 2011 on the expectation he would be feted, his hotel bills and bar tabs paid; instead, he was disappointed to receive a living allowance of just 65,000 naira ($413) a month. So Gen. Imomotimi has returned to the waterways, this time, he says, not to rob barges but to steal oil. "I take amnesty's money—what [little] they give me—I take it and I buy other guns," he says. "There's much, much more money in the creeks." A version of this article appeared August 22, 2012, on page A1 in the U.S. edition of The Wall Street Journal, with the headline: Nigeria's Former Oil Bandits Now Collect Government Cash. During the Offshore Technology Conference held in Houston, Texas, a seminar was organized by Energy and Corporate Africa on Oil and Gas exploration in Africa. Afripol‘s Principal Policy Strategist, Emeka Chiakwelu presented a paper on ‘Affects of oil spills in Niger Delta and Africa’ on the second day of the conference. African government officials including senior governmental bureaucrats from Nigerian presidency (Aso Rock) were in the conference. It happened that on the day of the presentation was the initial stage of the Gulf of Mexico oil spill. Afripol’s representative used the spill as point of reference and as a lunching pad to elaborate on Niger Delta continuous massive spill, thus drawing on their similarities and inaction in Nigeria. The penetrating scope of the paper presentation might have made Aso Rock officials unease but the presentation was spiking vitality and highlighting the significance of the government, the affecting community and oil companies working together to arrest the oil spill menace. The synergy can be realized by having a Standard Operating Procedures (SOP) and efficient coordination for oil spill response and subsequent remediation when it became necessary. The mountainous and sheath flow oil spill in Gulf of Mexico almost wrecked the livelihood of communities living in the region. The maritime life has received a devastating damage, the aquatic organism and its ecosystem may never be same again. Put it this way, it will take a long time even more than a century before the Gulf of Mexico will return to normality. The damage to the communities and ecology cannot be quantified only in monetary values, without adding the psychological, well being and pristine nature’s deformation of the area probably for ever. But in spite of all that happened there are still things that we all can learn from the sad episode. The governance and the peoples of developing nations that are confronting the issue of oil spill in consummative level to the Gulf of Mexico spilled can learn from American people and the government. In Nigerian region of Niger Delta that produced most of the oil that made Nigeria the sixth producer and exporter of crude oil, the waters and ecosystem have continuous oil spill in large scale since oil was discovered in the region for the past 50years. Niger Delta pristine environment has been decimated by oil spill at a scale bigger than that of Gulf of Mexico, which was approximated at a discharged of 2.5 millions gallons daily. According to a recent piece from New York Times: "As many as 546 million gallons of oil spilled into the Niger Delta over the last five decades, or nearly 11 million gallons a year, a team of experts for the Nigerian government and international and local environmental groups concluded in a 2006 report. By comparison, the Exxon Valdez spill in 1989 dumped an estimated 10.8 million gallons of oil into the waters off Alaska." The influential British Broadcasting Corporation (BBC) reported that "On 12 May 2009, Shell's Bomo manifold blew up, leaking massive amounts of crude. Local people say 39 hectares were contaminated. A second leak - from a derelict oil tap - had already been continuously spilling oil for years. But, according to the Nigerian government, there were more than 7,000 spills between 1970 and 2000. Environmentalists believe spills - large and small - happen at a rate of 300 every year." All these are showing that oil spills and environmental degradation at Niger Delta were massive and more often than were documented. The sad story is that poverty in Niger Delta has been enhanced because the source of livelihood which comes from fishing and agriculture has been destroyed by these continuous oil spills in the area. One thing must be clear; this is not the time to point accusing fingers to one another. It is the time for the people of the area, government and the big oil companies to work together. Nobody can deny this, the revenue generated from export crude oil has been enormous but enough resources have not been invested in the region. But gradually the present administration has been rising to challenge of re-writing the wrongs of the past. Nigerians can learn from Americans on the protection and the defense of the environment. First and foremost, we can be begin to get into our head that the big oil companies can not just abandon the government to carry out the responsibility of ecosystem oil cleanup and remediation. The oil companies have the utmost responsibility of keeping the area in the good shape as they found it. With the natives source of income being diminish the oil companies should find a way to compensate these communities. Nobody is suggesting that the oil companies should empty their savings and profits to the affected people but to acknowledge the sufferings of the poor and helpless people. Inasmuch that we are grateful that the oil companies are investing in Nigeria, they must not behave in way that only Nigeria is gaining from the business venture; the oil companies are making large amount of profits too. Intrinsically there must be symbiotic relationship where nobody is left behind but everybody is matching to a tune of one beat. Oil companies doing business at Niger Delta must be willing to sincerely work with people not just for sake of public relationship but to make a difference. We can learn from America about the empowerment of the community and citizens. Instead of the local communities of Niger Delta destroying oil infrastructures and kidnapping people they must come to table for negotiation equipped with practical solutions. The local environment activists must subscribed to non-violence and will only encourage peaceful demonstrations and outings. The government and the people must speak with one voice not to intimidate the oil companies but speaking with a sensibility to promotes peace, understanding and harmony between the people of Niger Delta and the oil companies. Being prepared and ready is the key. The most significant thing is the making provision of the materials and information needed to confront oil spill. The government of Nigeria has the supreme task of defining and elucidating in details her responsibilities to oil companies when oil spill occurs. The congress will pass a bill that empowers the presidency to supervise the cleanup and enforcements of cleaning oil spill. The bill or the passed law must enumerate how the cost of the cleanup will be shared and the enforcement procedures with regards to penalties and fines when necessary. 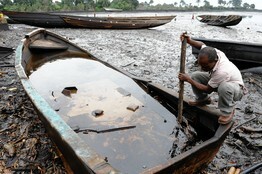 Chiakwelu said, "Nigerian lawmakers have a role to play on the issue of the oil spill. The legislators should introduce a bill and pass a law that is fully adequate and comprehensive on spill response and clean up. The propose bill will stipulate the roles of government agencies, oil companies and the community. The bill will come with implementation procedures and penalties for inaction and neglect." The law must not be source of intimidation but an enlightenment process and procedure that discourage irresponsibility and incompetence. The government of Nigeria will create a symbiotic relationship with the oil companies that will generate a synergy of competence, responsibities and mutual respect. Nigerian government will not shoulder all the responsibilities nor transfer them to the oil companies. But a shared responsibities must be eminent and adhered to. Oil companies must not abandon oil spill clean up to the government, after all Nigerian government does not have the scientific equipments and the technical know-how for cleaning oil spill. The most important is to be precautious, to clean oil spill and to maintain the integrity of the ecosystem. "Barack Obama will pursue three fundamental objectives on the continent. One is to accelerate Africa's integration into the global economy. A second is to enhance the peace and security of African states. And a third is to strengthen relationships with those governments, institutions and civil society organizations committed to deepening democracy, accountability and reducing poverty in Africa." Nigeria is the epicenter of African geo-politics, therefore a stable, healthy and prosperous Nigeria is good for Africa and the world. Nigeria is the most populous nation in Africa: Politically, culturally, economically and otherwise, resourceful South Africa notwithstanding, Nigeria overwhelms the continent. Nigeria is unique in Africa in the sense, that it has the requisite human and natural capitals to be making waves in economic development and scientific advancement in Africa. But intellectual lethargy especially the paucity of confidence embedded with self-doubt have dimmed its emerging light. Nigeria’s nascent democracy is gradually losing its luster and vibrancy due to the tilting to plutocracy and institutional disfiguration, impelled by uncompromising politicians. For Nigeria to continue to be a front line nation in Africa, it must put her house in order. A strength tempered with humility with a responsibility to her continent must be Nigeria’s targeted self actualization. President Obama must shun all the diplomatic shenanigans and niceties and be forthright with Africa’s leadership and compel them to amend their ways and maximize their continent’s God giving potentials. Nigeria must have quantifiable peace to enjoy steady economic progress. The most pressing is the issue of Niger Delta. Although Nigeria territorial integrity must be respected, Obama administration can work with Nigerian government providing logistic and confident building measures in negotiations with neglected communities in Niger delta. Also, The Obama administration must work with African Union in finding solutions to the cessation of conflicts and wars in the continent. Wars (especially internal strife) are ubiquitous in the continent. Some African governments and warmongers commit their resources to executing endless wars. The West must frown upon the sell of arms to these parties by checkmating their natives arms industries. Africom as a security tool Africa is confronted with lack of internal security which becomes a deterrent force in economic advancement. Capital flight and low foreign investment are precipitate and ramification of insecurity. With President Obama enormous social and political capital, he can do a better public relationship job of explaining and restreaming Africom. : Justify, Redirect or End it. American government have set-up Africom - a military command for Africa, which is to secure peace and goodwill in Africa. Many African countries are skeptical of America’s real intention, fearing that Africom can become a tool to punish America’s foes in the region in the name of fighting terrorism. The unexpressed fear is that it could be used to control and manipulate internal policies and status quo of African nations. America have to work succinctly to assiduously allay their fears and show to them the benefits of Africom. This must be done with goodwill and civility while respecting African territorial integrity . Peace and tranquility are good for business for all the parties concerned which can be achieved through dialogue and understanding. To this end, American diplomats in Africa have to embark on thorough enlightenment campaign. The building blocks of democracy are liberty, freedom and justice. Nigeria cannot be democratic nation without liberty. Nigerians must live in the system of government that encourages freedom and justice. The respect for fundamental human rights must be instituted and adhered to; an environment that provides self-help, self-improvement and self-innovation must be encouraged. Only freedom can make these things possible and make free enterprise a reality, so that free people can create wealth and advance human dignity. The Obama administration must encourage and support governance that accommodates checks and balances in Nigeria and indeed Africa. This will in turn provide accountability and respect for the populace. What Africa needs mostly include, elimination of dictators and socialist regimes, establishment of virile/free political platform and economy, rule of law and respect for individual rights. All these things do border on fundamental issues which foreign aid alone cannot redress. Until these issues are properly put right, the story of the optimum utilization of these billions of dollars from foreign aid will always remain a mirage. President Obama as the leader of the free world must support corruption elimination in Nigeria and Africa by helping local and international entities serious on the war against CORRUPTION in Africa. The responsibility of fighting corruption is too complex and gigantic to be left for one party. Both Africa and West must partake in the fight against corruption. The West must enact banking laws that will fish out bankers that accept laundered money and tainted wealth from corrupt African leaders and bureaucrats. Ill-gotten wealth must be returned to Africa without much ado, while the culprits must be exposed and prosecuted.
" African Union estimates that the continent loses as much as $148 billion a year to corruption. This money is rarely invested in Africa but finds its way into the international banking system and often into western banks. The proceeds of corrupt practices in Africa, (which the African experts group recommended in 2002 should be classified as a ‘crime against humanity’ because of its impact on ordinary people), are often laundered and made respectable by some of the most well known banks in the City of London or the discreet personal bankers of Geneva and Zurich." The Obama administration must encourage fair and equitable trade with Nigeria and Africa. The giving of aid must not be the only means to defeat poverty and alleviate quality of life in Africa. Nigeria must be encouraged to rely less on oil but to diversify her economy. The promotion of trade can be possible when concessions are made to emerging industries in Nigeria and Africa. The West can improve technological developments by investing in areas of science and technology that can sharpen the technical-know-how in the continent. Obama’s America and the West must stand for fair trade at the World trade organization by conscientiously removing agricultural subsidies given to their own agricultural sectors that adversely affect the traffic of commodities from Africa. Obama administration must not spoon feed Africans with depreciating aid and charitable donations but also compel them to comprehend that only trade and comprehensive reforms can be the panacea to poverty in Africa. Strategically, a wealthy and stable Nigeria can be a stabilizing force in Africa, and a wealthy Africa will apply her resources in resolving conflicts throughout the continent. Mr.Emeka Chiakwelu is the Founding director/Principal policy strategist of Afripol Organization.Africa Political and Economic Strategic Center (Afripol) is foremost a public policy center whose fundamental objective is to broaden the parameters of public policy debates in Africa. To advocate, promote and encourage free enterprise, democracy, human rights, conflict resolutions, transparency and probity in Africa.